Welcome to the corner of the website where we delve more deeply into Irv’s life and work. Here we will explore the stories behind photographs and recordings, feature guest essays and interviews from his contemporaries and artists working today, and keep you updated on what’s on the horizon. Hopefully you’ve already had a chance to explore the biography and press sections and listen to a few of the recordings. 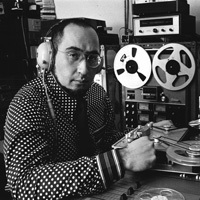 Irv was many things during his lifetime: photographer, recordist, graphic designer, sound designer, company president, expert witness. He brought these skills and a truely DIY attitude to his phenomenally successful environments series of eleven albums and other recordings like the Altered Nixon Speech.